Gmail is an incredibly smart engine, especially when you have multiple of them inside Shift; however, no technology is perfect. Sometimes, it filters important mail to its Spam folder. Want to know how to stop that from happening? Here’s the deal: It’s called whitelisting, and it’s freakin’ awesome. 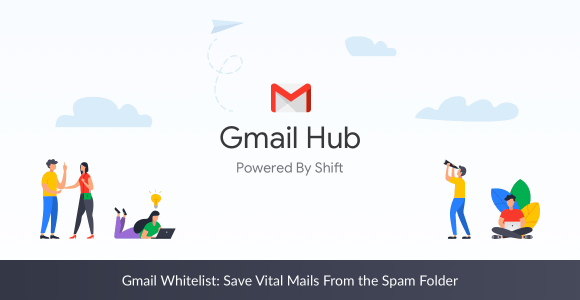 Gmail Whitelist lets you whitelist specific email addresses or even domain names so that when you get mail from them, they automatically mark as safe. Bills can stay in the Spam folder, but for everything else, there’s an option. Setting up a Whitelist for those whose emails you never want to miss is almost too easy. In order to whitelist a domain as opposed to a single email (ex. @tryshift.com over joebloggs@tryshift.com), the steps are pretty much the same. Instead of typing the email address in the “From” section, just type the domain instead (with or without the @ symbol).